Faculty of Science has established a strong national reputation for quality research and research training. Research excellence has been recognized both nationally and internationally through prestigious awards and funding support to our outstanding staff and student researchers. Research standards at our Faculty are internationally recognized to be at the cutting edge of scientific discovery. We publish about 400 peer-reviewed papers annually in reputed journals, more than half of these in top-tier (first quartile) journals. As a result, the Faculty has been able to strengthen and internationalize staffing profile by attracting renowned scholars. At all times, the Faculty administrative body continues creating a welcoming and supportive research environment. Major investments focused on equipped-central facilities to support on-going research activities of the staff as well as to facilitate the sharing of high-cost and high-performance equipment. 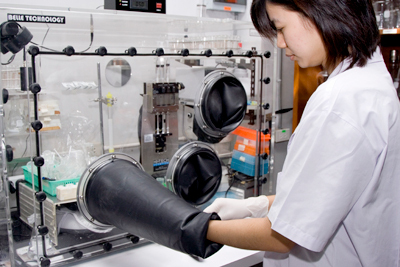 The facilities include Central Instrument Facility (CIF), Central Animal Facility, and Animal Tissue Culture Facility. Staff at the central facilities are also responsible for arranging technical workshops and training. The provision is designed to assist professional research development and skills. In addition to high quality fundamental research, we also focus on creating innovative applied technology solutions for economic, health and social development in Thailand. Such applied research at our Faculty can be classified into the following areas. Knowledge relevant to aquaculture and biology, with special emphasis on economically important marine resources such as shrimp, fish, abalone, sea cucumber, etc. Development of diagnostics and disease prevention technology. Improvement of crop and agricultural production. Development of food processes, quality and security. Detection methods for food safety and healthy food. Conservation and sustainable utilization of natural resources and biodiversity. Bio-systems for bioenergy and biofuels. New synthetic and catalytic methods for chemical and material preparation. Development of specialized materials or nano-materials for industries. Improvement of physical and chemical properties of natural polymer and rubber. Development of sensors, robots and smart devices for utilization in medical diagnostics, agricultural farming and production control. Diagnostics kits and analytical technology for convenient detection and quality control of food, cosmetics and environmental contamination. Causes and mechanisms of noncommunicable and aging diseases development. Knowledge associated with emerging and remerging infectious diseases. Development of prevention and new therapeutic guidelines for infectious diseases. Development of new therapeutic technology, biopharma and drugs. High throughput screening for finding new medicines against disease targets. Data science, analysis and mining for development of new understandings in biology. Systems analysis for understanding cellular and network communication and control. Basic knowledge and data analysis of earth, cosmic and astrophysics information. Monitoring of geological changes and effects from climate change. transformative learning and 21st century skills.